I wrote the first draft of this story at the Clarion West writers’ workshop in 2000. Clarion West is an intense six-week “boot camp for writers” and when I wrote this story I was feeling pretty beaten up and suffering from lack of sleep. The day after I finished it, I wrote in my journal that it “feels to me like a finely-made machine that doesn’t do anything.” When it was critiqued, it was more successful than I’d thought, but still fell flat; people liked the setting and descriptions, but found the characters stereotypical and the dialog stilted. Our instructor that week was Candas Jane Dorsey, and in our conference after the critique she helped me disassemble my head and begin to put it back together again. That experience was invaluable, but its emotional intensity made me skittish about the story, and it sat untouched on my hard drive for five years. In 2005 I finally hauled out the story and revised it extensively, lopping off the first and last scenes and making the character Dan less of a scary Deliverance-style hick stereotype. I also renamed the main character after Seattle writer Edd Vick, whose wife Amy Thomson bought naming rights in a charity auction. I had the revised story critiqued again, at Wiscon and with my local critique group the Lucky Lab Rats, and revised it one more time before finally submitting it. The first place I sent it was F&SF, and Gordon van Gelder replied with a detailed two-page letter. I rewrote it as requested, including changing the ending so that Bigfoot is revealed as a tool-user, but Gordon still didn’t like it. 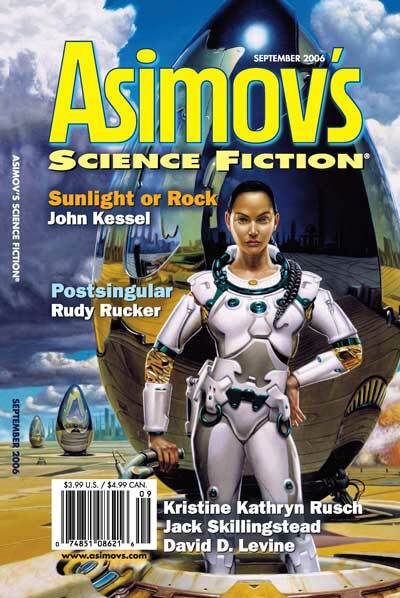 But Sheila Williams at Asimov’s did, and I thank Gordon for the suggestions that made it a much stronger story. “Indeed.” I probed the droppings with a stick. Seeds indicated a diet of berries, and there was a lot of other vegetable fiber, but no hair or other indication that meat was being eaten. And it certainly did stink. I sealed a sample into a plastic bag. An hour and a half later, we sat in the dimness of Dan’s shack, with Dan nursing a Pabst Blue Ribbon from his wheezing refrigerator. On the table between us sat a crudely-made clay vase, glazed with childish splotches in green and blue, holding an incongruous spray of delicate pale pink starflowers. But I kept glancing at the wall behind him, where a shotgun and two rifles rested on pegs… clean, well-oiled, and ready for immediate action. “I don’t think so,” said Dan. I looked up just in time to see the heavy black iron skillet coming down on my head.